We’ll you’ve come to the right place! Because we’re uncovering some of the best hikes on the Sunshine Coast, tried and tested, to get your heart racing, your face glowing and your activewear, well, a little worn in (after all, there’s only so much wear and tear that comes with café schmoozing). So, what are you waiting for? 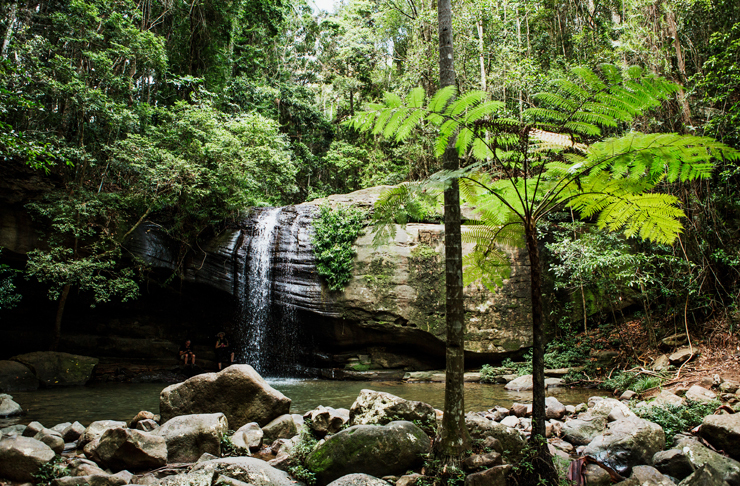 Get your sneakers on (or go super coastal in thongs, cool guy), and hit this list of bush walks, mountain climbs, and rainforest trails. Judging by the amount of #mountcoolum posts, this has to be one of the best hikes on the Sunshine Coast. But don’t let the smiley Insta photos fool you—a sneaky lo-fi or sierra filter can do wonders on a flushed face! This hike is actually hash-tag hard but if you can make it to the top, you’ll be rewarded with stunning vistas that stretch from Noosa National Park down to the high rises in Caloundra and over towards the lush countryside at Maroochy River. Totally worth your sweat (and those tears). It would be rude to visit Noosa and not drop by the national park. Because you simply cannot experience Noosa in all its glory without witnessing this slice of natural paradise. Okay, so you may have already seen the famous sights printed on a postcard, but experiencing it up close and personal? That’s a whole new level. Speaking of levels, there’s a track to suit everyone, from your triathlete wannabe bro to your shuffling nanna. But for a good hike where persistence pays off, our pick is the coastal trail to Alexandria Bay. For au naturel enthusiasts, this isn’t the time to be shy. A-Bay is a renowned nudist beach, so get your kit off and soak up some vitamin sea, just as nature intended. Kondalilla, the aboriginal term for “rushing water”, is just that. In fact, it’s 90 meters of rushing water plummeting into a gorgeous valley. If you’re after a real adventure, ditch the easy 2.4km Picnic Creek Circuit, even the moderate 3.2km Rock Pools walk, and get lost on the 4.6km Kondalilla Falls Circuit. This subtropical rainforest trail winds around chilled gorges and secluded rock pools with plenty of scenic lookouts along the way. Hint: use this opportunity to take in the view, and some deep breaths too. Because once you reach the main event, it’s another 4.6km back! Not a fan of long hikes? Keep it short and (not-so) sweet with Mt Cooroora’s 2km return trip. A 2km walk sounds a breeze, right? Wrong! Your legs will be shaking at the knees after tackling just 1km of this steep, strenuous hike. If you’re really feeling the burn and contemplating turning back early, get the grateful vibes flowing knowing that unlike those crazy fitness-y people who knock over Mt Cooroora in 20 minutes during the King of the Mountain challenge, you can take all the time in the world. And you won’t lose a medal for dallying. Amen to that! Love a secret sunrise? We've rounded up the 7 Secret Sunrise Spots On The Sunshine Coast you gotta check out! What about the 7 Of The Best Sunset Spots On The Sunshine Coast.